The newly built single-family house at 527 Fourth Ave. S.E. A ride this week took me down Fourth Avenue in Albany’s Hackleman Historic District, and I stopped to photograph a newly built house that looked close to being completed. I was struck by how nicely it fits in with the older houses on the street. Because the address, 527 Fourth Ave S. E., is in a historic district, the plans and design had to be approved by the Albany Landmarks Advisory Commission. The commission gave that approval following a hearing on May 2. 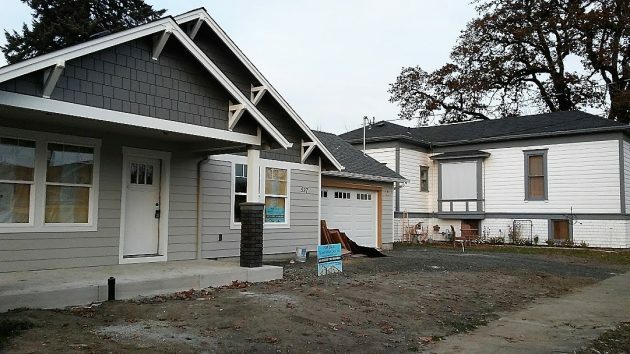 The builders, Michael and Linda Quinn and their firm, Quinstruction Development Inc., had gone to some lengths to make their design compatible with the neighborhood. Their Landmarks application showed numerous illustrations of windows, siding and other features of houses in the vicinity. The single-story houses on both sides of 527 are of a venerable age. 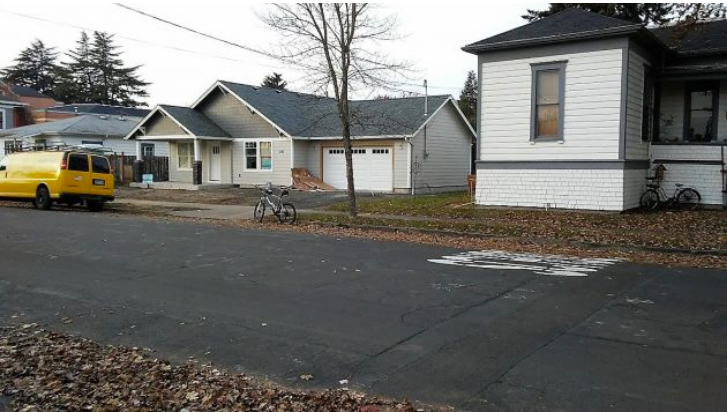 The one to the east was built in 1888, though renovated since, and the one on the other side dates from 1915, according to the records at the Linn County assessor’s office. The new house measures 1,420 square feet, plus a 180-foot patio and a 380-foot garage. Before the project is done, the builders will construct a new sidewalk in front and replace the street tree that destroyed the old one. The house was built on a vacant lot where, on Sept. 6, 2011, a fire destroyed the century-old house that was there. And as the Democrat-Herald reported two days later, the fire department had to have the place bulldozed to put out the flames. The Quinns bought the lot in February 2018 for $47,000, according to the county. Another view of the place without the distracting presence of my bike parked on the curb. Great effort & a good fit. I would have made the porch & overhang a bit wider so a porch swing could fit there. Perfect to sit & have morning coffee & say “Hi” to neighbors. With the other house (H.H. earlier report) to the east being redone it’s improving one residence at a time. I’m not sure whether the second sentence depended on the first sentence. Anyway, I notice this problem a lot ever since I glanced through some of ‘A Pattern Lamguage’ by Christopher Alexander, et.al. Another great job by the Quinns and Quinstruction. They always build quality houses. Ya got my vote to suckle at the CARA teet to enable your company to make worthwhile improvements to that district!! They did a better job of designing a new house in an old neighborhood than the Edgewater village folks did with their waterfront houses. They look out of place across the street from their very first homes and the 70-100 year old homes that are nearby.